We are Beary Happy to introduce our new Daisy Alexander collection. You will love these cute bears in fine 100% cotton. This long sleeve classic pajama has beautiful detailing throughout. You might like the matching pj pant or nightshirt. Big Feet Hoodie Onesie Jumpsuits are the answer to both active wear and lounge wear. This soft Cotton/Poly blend is excellent for staying warm and comfy indoors as well as the perfect accessory for runners, skiers, swimmers, surfers, snowboarders, campers, hunters, fishermen, shoppers, gardeners. Big Feet Onesie Jumpsuits have a large hood with drawstring and 3 pockets including the deep side pocket which is zippered to protect your valuables. Available in unisex sizes XS-XXL. Mister Lobster..enough said. Check out the matching short sleeve capri pajama set. Have "Seychelles" dreams tonight in this super soft classic pajama. You might like the matching capri length pajama or shorts set. The Cat's Pajamas team searched the globe for the perfect knit fabric for their pajamas. They started with hand-pulled Peruvian Pima cotton, which is known for its silky luster and unbelievably soft hand. They combined this Pima cotton with Modal to get the perfect drape and added Elastane to give it stretch and recovery so they look and feel great with every wear. These pj's will become fast favorites just in time for Spring. Luxe Pima is an ultra-soft, super light tightly woven cotton. It is The Cat's Pajamas highest quality fabric and, like voile, is ideal for warmer climates or for people wanting a light, cool sleepwear set. You might like the matching capri length pajama set. Remember those footed pajamas that you loved as a kid? 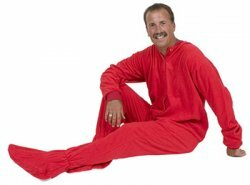 Well, here in a bright red micro-polar fleece fabric we bring you a one piece footy PJ from Big Feet Pajamas. This PJ is unique, whimsical, practical, warm, and comfy. Ideal for chilly nights, Big Feet footies are constructed of a durable, yet luxurious 230 weight, anti-pill fabric. Button front with banded cuffs and collar plus a drop seat. Once you jump into these footies, you’ll never want to jump out! Truly unisex for men and women. Check out the matching red Big Feet Footy for kids. Remember those footed pajamas that you loved as a kid? Well, here in a soft pink micro-polar fleece fabric we bring you a one piece footy PJ from Big Feet Pajamas. This PJ is unique, whimsical, practical, warm, and comfy. 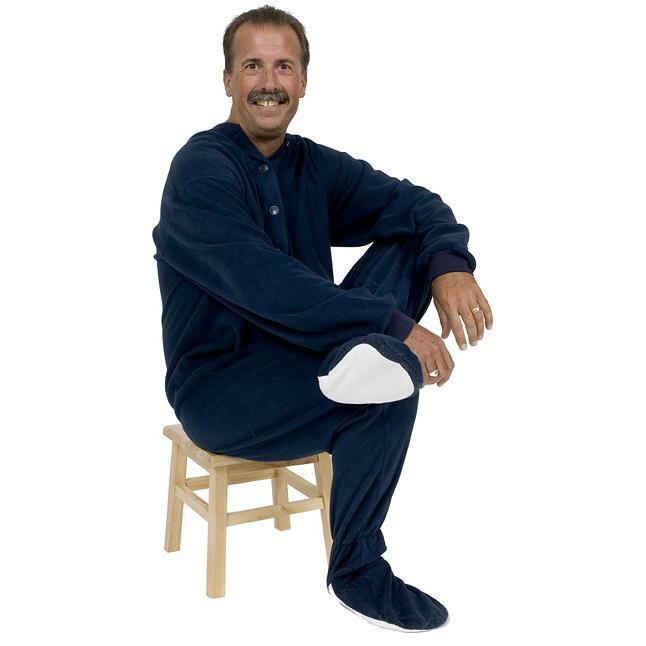 Ideal for chilly nights, Big Feet fleece footies are constructed of a durable, yet luxurious 230 weight, anti-pill fabric and features a drop seat. Refer to the size chart to determine which size is best for you. 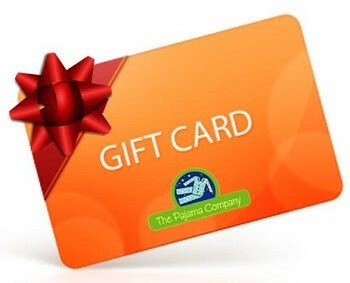 You might like the matching footie for kids. Perfect for those chilly days and nights, you're sure to get a good night’s sleep in these 100% cotton flannel footy pajamas from Big Feet. A classic red plaid with a button front and a drop seat, this pajama has a banded cuffs and collar. Visit your inner child and jump into a pair of fun, footy PJ's. Truly unisex perfect for both men and women in sizes XS-XL.